This Valentine's Day, help your child learn to love numbers with this adorable collection of heart math worksheets. Cupid needs help with his numbers! Invite your child to fill in the missing odd numbers to help Cupid find his way to his heart. Take the fun and color of Valentine's Day and add in this subtraction worksheet for fun simple subtraction learning. Treat yourself to a little candy on Valentine's day! This candy maze is sure to sweeten your child's day as she fills in all the missing even numbers. Would you be my valentine? 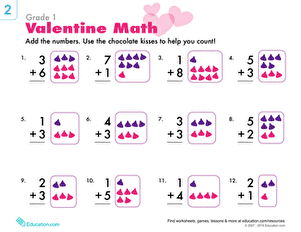 Introduce your kindergartener to basic addition with Valentine's Day picture math!